Hosting the 2010 Winter Olympics cannot be justified on economic grounds alone. 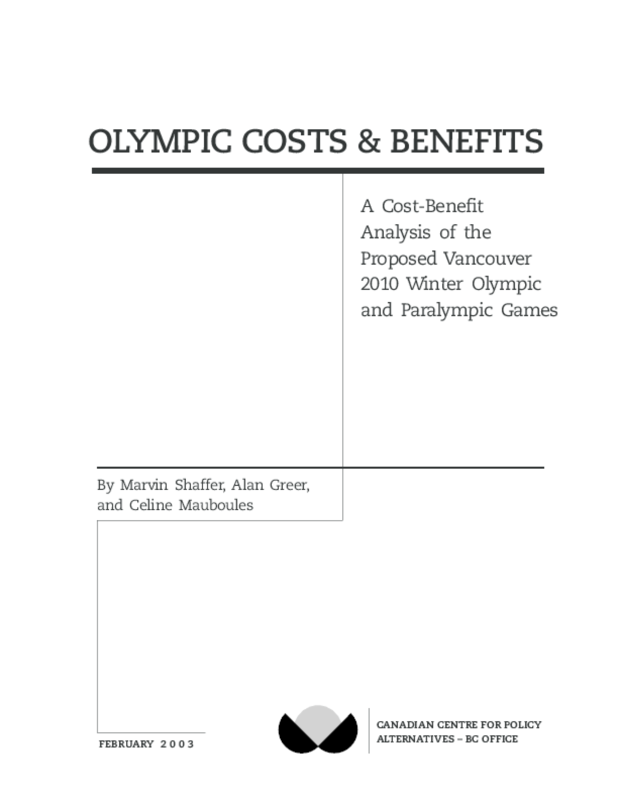 "The Games are not attractive from a financial point of view," says Dr. Marvin Shaffer, co-author of the study and one of the architects of British Columbia's Multiple Account Guidelines (used for undertaking cost-benefit analyses of major capital projects). "If Vancouver hosts the 2010 Winter Olympics, there will be a substantial net cost to British Columbians in the order of $1.2 billion." Alan Greer, co-author of the study, says the economic benefits of hosting the Games are limited. "Job creation estimates have been wildly exaggerated. Realistic employment estimates range from 1,500 to 5,600 jobs created over the seven years the Games are estimated to have an impact. Based on a net cost of $1.2 billion to host the Games, that's a public subsidy of $220,000 to $820,000 per job." The Olympics also carry significant environmental and social risks. "There are some innovative ideas in the Bid Book for mitigating social and environmental costs, but many of them haven't been budgeted and, if implemented, will likely mean increases to the overall cost of the Games." says Celine Mauboules, co-author of the study. "That's not to say the Olympics don't have benefits," says Mauboules. "The positive impacts for British Columbians include the pride and enjoyment from hosting the Games, the opportunity to attend events, and the use of new sports, housing and transportation facilities, to name a few." Seth Klein, the CCPA's BC Director, says the question for policy makers and the public is: Do the benefits outweigh the substantial price tag that comes with hosting the Games? "To date, the public has received inadequate information about the costs and benefits of hosting the Winter Olympics. We've basically done government's job for them. Both federal and provincial guidelines recommend the use of multiple account evaluations for such an initiative. Yet neither level of government, nor the Bid Corporation, has undertaken such an evaluation." "The Olympics have too often been pitched as having miraculous economic powers," says Klein "They do not. Like all public policy choices, they come with benefits and costs, and will require trade-offs."